Le monde serait-il plus vaste et plus surprenant qu'il ne croyait ? (phot. Intermedia). Réal. : Oliver STONE; Scén. : Oliver STONE, Christopher KYLE & Laeta KALOGRIDIS; Images : Rodrigo PRIETO; Prod. : Moritz BORMAN (producer), Jon KILIK (producer), Aslan NADERY (executive producer : IMF), Gianni NUNNARI (co-executive producer), Volker SCHAUZ (executive producer : IMF), Thomas SCHÜHLY (producer), Iain SMITH (producer), Oliver STONE (producer), Fernando SULICHIN (co-executive producer); Montage : Yann HERVÉ, Gladys JOUJOU, Alex MARQUEZ, Thomas J. NORDBERG; Casting : Mark BENNETT, Billy HOPKINS, Lucinda SYSON; Prod. Design : Jan ROELFS; Art Direction : Desmond CROWE, James LEWIS, Kevin PHIPPS (senior art director), Stuart ROSE; Décors : Jim ERICKSON; Costume Design : Jenny BEAVAN. - Makeup Department : Jan ARCHIBALD (chief hair designer), Brian BEST (special makeup effects artist), Anita BURGER (hair stylist), Stuart CONRAN (special makeup effects artist), Paul GOOCH (makeup artist), Peter HAWKINS (special makeup effects artist), Michael KREHL (crowd makeup artist), Waldo MASON (special makeup effects artist), Steve PAINTER (special makeup effects supervisor), Nikita RAE (makeup artist), Petra SCHAUMANN (crowd hair), Lesley SMITH (hair stylist), Lesley SMITH (makeup artist), Barbara TAYLOR (hair stylist), Jeremy WOODHEAD (makeup designer). - Production Management : Karim ABOUOBAYD (production manager Maroc), Sarah BRADSHAW (unit production manager), Jonathan HOOK (unit manager), Cindy IRVING (production manager), Angus More GORDON (production manager), Piya PESTONJI (production manager Thaïlande), Malcolm SCERRI-FERRANTE (production manager 2nd unit Malte), Michael SHARP (production manager Thaïlande). - Second Unit Director or Assistant Director : Tarik Ait Ben ALI (3rd assistant director Maroc), Peter BENNETT (1st assistant director 2nd unit), Tom BREWSTER (3rd assistant director 2nd unit), Darwin BROOKS (3rd assistant director), Ali CHERKAOUI (key 2nd assistant director Maroc), Dale DYE (2nd unit director), Yann Marie FAGET (2nd second assistant director Maroc), Richard GOODWIN (co-2nd assistant director), Sallie Anne HARD (2nd assistant director 2nd unit), Ahmed HATIMI (1st assistant director Maroc), Zinedine Ibnou JABAL (2nd assistant director Maroc), Alex OAKLEY (1st assistant director aerial unit), Gary POWELL (action unit director Thaïlande), Michael STEVENSON (2nd assistant director), Adrian TOYNTON (2nd assistant director), Simon WARNOCK (1st assistant director). - Art Department : Martin ASBURY (storyboard artist), David BALFOUR (property master), Alice BIDDLE (draughtsperson), Julian CALDOW (concept illustrator/storyboard artist), Antonio CALVO-DOMINGUEZ (junior draughtsman), Claudio CAMPANA (assistant art director), Dominic CAPON (production buyer), Tristan CARLISLE-KITZ (props), Gary CLARK (painter), Robert J. DUGDALE (assistant scenic artist), Saida ELIDRISSI (art department assistant), Andy EVANS (construction coordinator), Dan FRYE (props mould-maker), Katie GABRIEL (art department co-ordinator), Heidi GIBB (draughtsman), Christian HUBAND (assistant art director), Nicky KAILL (scenic artist), Jason KNOX-JOHNSTON (assistant art director : action vehicles), Jonathan MCKINSTRY (supervising art director), Sophie NEWMAN (assistant set decorator), Tom STILL (assistant art director), Lotta WOLGERS (set designer). - Sound Department : Vincent ARNARDI (sound re-recording mixer), Frédéric ATTAL (sound editor), Selim AZZAZI (sound editor), Damien BERA (sound recordist), Julien BOURDEAU (assistant sound editor), Nicolas BOURGEOIS (sound technical assistant), Katia BOUTIN (supervising dialogue editor), Samuel COHEN (boom operator), Vincent COSSON (sound technical assistant), Capucine COURAU (assistant dialogue editor), Gurwal COÏC-GALLAS (assistant sound editor), Chris DAVID (sound re-recording mixer), Anne DELACOUR (dialogue editor), Iain EYRE (ADR editor), Chris FITZGERALD (ADR recordist), Alek GOOSSE (sound re-recording mixer), Jean GOUDIER (supervising sound editor), Katie HARRIS (sound trainee), Alistair HAWKINS (assistant ADR editor), Sylvain MALBRANT (assistant dialogue editor), Paul MASSEY (sound re-recording mixer), Vincent MONTROBERT (sound editor), Jean-Paul MUGEL (production sound mixer), Julien PEREZ (sound recordist), Wylie STATEMAN (supervising sound editor), Greg STEELE (ADR mixer), Bruno TARRIÈRE (sound re-recording mixer), Camille TOUBKIS (assistant sound editor), Yannick VERGNE (assistant sound re-recording mixer), Ken YASUMOTO (sound designer), Phillip Mark FREUDENFELD (sound studio technician (non-crédité)), Special Effects : Kassou ABDELALI (scanning and recording), Christophe BELENA (scanning and recording), Terence J. COX (special effects set supervisor), Peter FERN (senior technician), Tina LIN (scanning and recording), Peter NORCLIFFE (costume props : ROBERT ALLSOPP & ASSOCIATES), Visual Effects : Aurelia ABATE (visual effects producer : BUF), Chadi ABO (digital effects artist), Nicolas AITHADI (CG supervisor : MPC), Nicolas AITHADI (on-set supervisor : MPC), Louise BAKER (pre-visualization artist), Laetitia BEAUJARD (visual effects coordinator), Xavier BEC (research and development director : BUF), Graham BELL (motion capture assistant : MPC), Karine BINAUX (visual effects coordinator : BUF), Paul BIRKETT (roto artist), Nicolas BONNELL (production supervisor : Paris, BUF), Lucie BORIES (digital compositor), Andre BRIZARD (digital compositor : MPC), Jérémie BRUDIEUX (Alexandria sequence supervisor : BUF), Pierre BUFFIN (visual effects : BUF), Astrid BUSSER-CASAS (digital compositor), Jordi CARDUS (lead technical director : MPC), Olivier CAUWET (Babylon sequence supervisor : BUF), Stephane CERETTI (visual effects supervisor : BUF), Mehdi CHERIF (additional onset supervisor : video motion capture, BUF), Nicolas CHEVALLIER (Alexandria co-sequence supervisor : BUF), Terry CLOTIAUX (visual effects producer), Danielle COSTA (visual effects coordinator), Robin L. D'ARCY (visual effects producer), Yann De CADOUDAL (matte and roto supervisor : BUF), Jean-Claude DEGUARA (animator : MPC), Valerie DELAHAYE (production supervisor : Los Angeles, BUF), Boris DORES (software engineer : research and development), Martyn DRAKE (systems : MPC), Sébastien DROUIN (visual effects supervisor : BUF), Olivier DUMONT (Pella sequence supervisor : BUF), Olivier DUMONT (on set supervisor : BUF), Laurens EHRMANN (Hindu Kush sequence supervisor : BUF), Ron FRANKEL (previsualisation supervisor), Nicolas GALAN (software engineer : research and development), Sophie GATEAU (digital artist : BUF), Anne E. HALL (lighting technical director), Isabelle HAULIN (software engineer : research and development), Robin HOLLANDER (digital compositor), Rudi HOLZAPFEL (visual effects supervisor : MPC), Alexandra HOUILLON (additionnal visual effects plates coordinator : BUF), Pete HOWLETT (roto/prep artist), Suzanne JANDU (digital compositor), Rovela JEAN-PAUL (lead lighting technical director : MPC), Barry KANE (rendering technical director : MPC), Aurelie LAJOUX (digital compositor), Kirsty LAMB (digital compositor), Sebastien Le NEVE (digital artist), Rich LEE (previsualization supervisor), Gary MARSHALL (motion capture assistant : MPC), Christoph MATTHIESEN (digital artist), David MAYHEW (matchmover : MPC), Alasdair MCNEILL (digital artist), Fabien MICALLEF (software engineer : research and development), Ian MURRAY (visual effects coordinator), Stephane NAZE (Gaugamela aerial shots supervisor : BUF), Isaac PARTOUCHE (motion capture supervisor : MPC), Alexis PERASTE (digital artist), Glen PRATT (digital compositor), Olivier PRON (animation supervisor : BUF), Clement RAMBACH (software engineer : research and development), Caroline RIVIÈRE (visual effects coordinator : BUF), Lucas SALTON (digital artist : BUF), David SANTINI (additional onset supervisor : video motion capture, BUF), John SCHEELE (visual effects supervisor), Eduardo «Lalo» SCHMIDEK (digital artist : MPC), David SWIFT (texture artist : MPC), Kat SZUMINSKA (compositing supervisor : MPC), Giuseppe TAGLIAVINI (digital compositor : MPC), Giuseppe TAGLIAVINI (roto/prep supervisor : MPC), Andy TAYLOR (visual effects coordinator), Hervé THERON (software engineer : research and development), Gregory TOURNIER (visual effects coordinator : BUF), Daniel TRUJILLO (digital artist), Christophe VERSPIEREN (software engineer : research and development), Dominique VIDAL (Gaugamela sequence supervisor : BUF), Giuliano Dionisio VIGANO' (digital compositor), Ryusuke VILLEMIN (software engineer : research and development), Jean-Marc van RIJSWICK (digital artist : BUF), Denise BALLANTYNE (visual effects consultant (non-crédité)), Sian LAWSON (biomechanist (non-crédité). - Cascades : Luis Miguel ARRANZ [= Luis Miguel VILLAREAL ARRANZ (cascades), Nicola BERWICK [= Nikki BERWICK] (maître d'armes), Sean BUTTON (cascades), Ryan CAREY (cascades), Rodney COOK (cascades), Ben COOKE (cascades), Ben DIMMOCK (cascades), Levan DORAN (cascades), Steve DRAGE (cascades), Rick [Ricky] ENGLISH (cascades), Glenn FOSTER (cascades), Pedro García GARCÍA [= Pedro Luis GARCIA GARCIA] (cascades), Mark HENSON [= Franklin HENSON] (assistant stunt coordinator), Lou HORVATH (cascades), Jason HUNJAN (cascades), Rowley IRLAM (doublure Colin Farrell), Seng KAWEE (cascades), Luke KEARNEY (cascades), Theo KYPRI (cascades), Michael Ian LAMBERT [= Mike LAMBERT] (cascades), Maurice LEE (cascades), Luis Miguel ARRANZ LOSA (cascades), Inocencio LOSADA [= Innocencio LOSADA SILVA] (cascades), Philippe LOSSON (cascades), Antonio MARSH (cascades), Juan Manuel Cabrera PASCUAL (cascades), Gary POWELL (stunt coordinator), Joel [Joël] PROUST (cascades), Angelo RAGUSA (cascades), Gabriele RAGUSA (cascades), Florian ROBIN (cascades), Mark ROUNDTHWAITE (cascades), Campbell ROUSSELLE (cascades), Luis Manuel GUTIERREZ SANTOS (cascades), Paul SHAPCOTT (cascades), José Antonio ONA SÁNCHEZ (cascades), Stuart THORP (cascades), David WARE (cascades), Freddie Joe FARNSWORTH (doublure cascades (non-crédité)), Smiljevic IGOR (stunt fighter (non-crédité)). - Divers : Rene ADEFARASIN (assistant camera), Jeanette AGARONOFF (production assistant), Phyl ALLARIE (assistant production coordinator), Tom BATCHELOR (assistant to managing director : Intermedia), Brian BAVERSTOCK (transportation manager), Mona BENJAMIN (production coordinator Maroc), Nicola BERWICK (sword master), Charles BODYCOMB (armorer), Adrian Borg GHIGO (camera car assistant), Simon BRINDLE (supervising principal armourer), Sarah BROOK (assistant accountant), Julie BROWN (script supervisor : 2nd unit), Billy BUDD (military advisor), Jaap BUITENDIJK (still photographer), Al BURGESS (production manager Maroc), Budd CARR (music supervisor), Donna CASEY (assistant accountant), Katharine CHADWICK (production assistant Maroc), Usha CHAMAN (assistant production coordinator Maroc), Catherine CHARLTON (dialogue coach), Cyril CONTEJEAN (post-production supervisor), Clare CUNNINGHAM (assistant accountant), Charles CURRIER (military advisor), Damien DELANEY (assistant to choreographer), Arthur DUNNE (transportation coordinator), Dale DYE (senior military advisor), Stephanie DÖLKER (contact Londres), Louis ELMAN (ADR voice casting), Charlie ENGLAND (assistant camera), Dave EVANS (designer : principle weapons), Dave EVANS (key armorer), Freddie Joe FARNSWORTH (military advisor), Chantal FEGHALI (post-production supervisor), Peter FIELD (camera operator : 2nd unit), Sue FIELD (script supervisor), Steve FLETCHER (on-set tutor), Duncan FLOWER (assistant location manager), Tom FORBES (production assistant), Olivier FORTIN (assistant camera), Robin Lane FOX (historical advisor), John GAMBLE (1st assistant camera), Corey GARNETT (post-production technology consultant), Rebecca GATRELL (music coordinator Grande-Bretagne), Piers GIELGUD (choreographer), Suzanne GIELGUD (casting : dancers), Simone GOODRIDGE (key production coordinator), Eugene GROBLER (electrician), Carolyn HALL (financial controller), John HIGGINS (gaffer), David HOUSE (stand-in), W.C. «Chunky» HUSE (key grip : 2nd unit), Victor JENKINS (casting runner), Dylan JONES (video assistant), Emily LASCELLES (production coordinator Thaïlande), Deborah LEAKEY (assistant accountant), Gilbert LECLUYSE (additional camera operator), Matt LOPEZ-DIAS (grip), Chaz LYON (assistant camera), Laird MACINTOSH (military advisor), Simon MARSDEN (location manager Maroc), John MARZANO (aerial director of photography), Eduardo Enrique MAYÉN (photographic pre-visualisation), Christian MCWILLIAMS (location manager), Dean MORRISH (assistant camera), Chris NORMAN (assistant accountant), Berenice PERCIVAL (casting assistant), Reg POERSCOUT-EDGERTON (casting runner), Andrew PYKE (construction accountant), Sylvia PYKE (assistant : Mr. Smith), George RICHMOND (camera operator : «A» camera), George RICHMOND (steadicam operator), Jonathan «Chunky» RICHMOND (1st assistant camera : «A» camera), Julia Dewey RUPKALVIS (military advisor : weapons master), Simona SERAFINI (location scout), Michael SHARP (location manager), Sarah SHEPHERD (textile artist), David SINFIELD (electrician), Michael SINGER (publicist), Joanna SLENNETT (assistant production coordinator), Joanna SLENNETT (production coordinator), Gary SMITH (grip), Mike STOKEY (key military advisor), Sarah TROWSE (production accountant Thaïlande), Lupt UTAMA (costume assistant Thaïlande), Mahaut VIDAL (production coordinator), Tom WALLER (editing department production assistant), Martin WARD (video playback operator), Ben WILSON (1st assistant camera), Marc WOLFF (pilot : camera helicopter), Michael J. HARKER (completion bond company representative (non-crédité)); Musique : VANGELIS [Vangelis PAPATHANASIOU]. 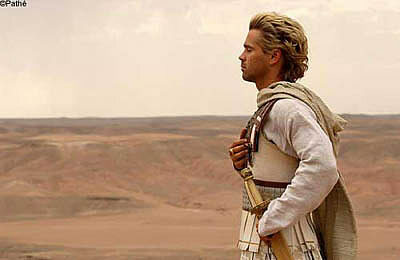 Colin FARRELL (Alexandre le Grand) - Jared LETO (Hephæstion) - Anthony HOPKINS (Ptolémée, âgé) - Rosario DAWSON (Roxane) - Angelina JOLIE (Olympias) - Jonathan RHYS-MEYERS (Cassandre) - Val KILMER (Philippe) - Ian BEATTIE (Antigone) - Brian BLESSED (entraîneur lutte) - Elliot COWAN (Ptolémée, jeune) - Rory McCANN (Cratère) - Joseph MORGAN (Philotas) - Connor PAOLO (Alexandre, jeune) - Erol SANDER (prince perse) - Stéphane FERRARA (commandant bactrien) - David BEDELLA (Cadmos, scribe) - Jessie KAMM (Alexandre, enfant) - Fiona O'SHAUGHNESSY (nourrice) - Patrick CARROLL (Hephæstion, jeune) - Peter WILLIAMSON (Néarque, jeune) - Morgan Christopher FERRIS (Cassandre, jeune) - Robert EARLEY (Ptolémée, jeune) - Aleczander GORDON (Perdiccas, jeune) - Christopher PLUMMER (Aristote) - Gary STRETCH (Cleitos) - John KAVANAGH (Parménion) - Nick DUNNING (Attale) - Marie MEYER (Eurydice) - Mick LALLY (marchand de chevaux) - Denis CONWAY (Néarque) - Neil JACKSON (Perdiccas) - Garrett LOMBARD (Leonnatos) - Chris ABERDEIN (Polyperchon) - Michael DIXON (soldat au feu de camp) - Tim PIGOTT-SMITH (augure) - Raz DEGAN (Darius) - Tadhg MURPHY (soldat mourant) - Jean Le DUC (gros eunuque) - Francisco BOSCH (Bagoas) - Annelise HESME (Stateira) - Tsouli MOHAMMED (chambellan perse) - Toby KEBBELL (Pausanias) - Laird MACINTOSH (officier grec) - Rab AFFLECK (écuyer d'Attale) - Féodor ATKINE (père de Roxane) - Harry KENT (porteur de coupe 1) - Sam GREEN (porteur de coupe 2) - Bin BUNLUERIT (roi indien) - Jaran NGAMDEE (prince indien) - Brian McGRATH (médecin) - Suzanne BULLOCK (danseur Roxane 1) - Kate ELOUISE (danseur Roxane 2) - Gillian GRUEBER (danseur Roxane 3) - Michelle LUKES (danseur Roxane 4) - Anjali MEHRA (danseur Roxane 5) - Anthony Jean Marie KURT (danseur Bagoas 1) - Marta BARAHONA (danseur Bagoas 2) - Monica ZAMORA (danseur Bagoas 3) - Benny MASLOV (danseur Bagoas 4) - Tania MATOS (danseur Bagoas 5) - Leighton MORRISON (danseur Bagoas 6) - Isaac MULLINS (danseur Bagoas 7) - Monica PEREGO (danseur Bagoas 8) - Matthew POWELL (danseur Bagoas 9). Coût : 150 millions de dollars. Durée du tournage : plus de cinq mois. Les jardins suspendus de Babylone, la bibliothèque d'Alexandrie, le palais de Darius ont été reconstitués sur quatre studios de Pinewood et un de Shepperton (Londres). Extérieurs filmés dans les environs de Marrakech (la «Macédoine» à Essaouira) au Maroc. La «bataille des éléphants» à Saraburi dans la province d'Ubon Ratchathani, un parc botanique thaïlandais sur le Mékong, en Thaïlande, près de la frontière birmane. Images de fond filmées dans l'Himalaya par Rodrigo Prieto. A Malte, le port d'Alexandrie et son célèbre phare. 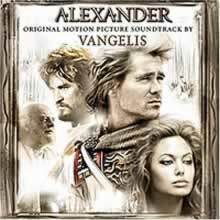 CD : VANGELIS, Alexander, Sony, réf. SK 92942 (Total Time : 56'23"). 1. Introduction (1'32"); 2. Young Alexander (1'36"); 3. 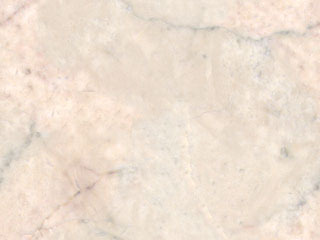 Titans (3'59"); 4. 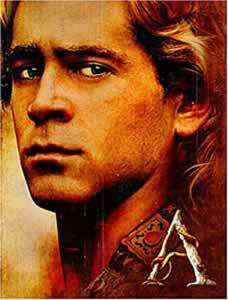 The Drums of Gaugamela (5'20"); 5. One Morning at Pella (2'11"); 6. Roxane's Dance (3'25"); 7. Eastern Path (2'58"); 8. Gardens of Delight (5'24"); 9. Roxane's Veil (4'40"); 10. Bagoas' Dance (2'29"); 11. The Charge (1'41"); 12. Preparation (1'42"); 13. Across the Mountains (4'12"); 14. Chant (1'38"); 15. Immortality (3'18"); 16. Dream of Babylon (2'41"); 17. Eternal Alexander (4'37"); 18. Tender Memories (2'59). «Roxane's Veil» featuring VANESSA-MAE, violin. Vocals on «Roxane's Veil» by Konstantinos PALIATSARAS and Irina VALENTINOVA-KARPOUCHINA. Vocals on «Gardens of Delight» by Irina VALENTINOVA-KARPOUCHINA. Vocals on «The Drums of Gaugamela» by EPIRUS POLYPHONIC ENSEMBLE. Harp : Maria BILDEA - Duduk on «Eastern Path» by Vahan GALSTIAN. Assistant Producer : Frederick ROUSSEAU - Orchestrations : Nic RAINE. Mixed by Philippe COLONNA - Electronic Instruments Programmer : Vangelis SAITIS. Music Transcriptions : Irina VALENTINOVA-KARPOUCHINA. Music Production Consultant : Chantal FEGHALI. Orchestral Score and Choir Performed and Recorded at the STUDIO GUILLAUME TELL in Paris. Conducted by Nic RAINE - First violin : Dominique LEMONNIER. Orchestra Contractor : Christophe BRIQUET - Assistant Contractor Alexane ALVES DE SOUZA. Sound Engineers : Philippe COLONNA, Frederick ROUSSEAU, Vangelis SAITIS, Stephane BRIAND. Assistant Sound Engineer : Pierre BRIEN. Copyist : Vic FRASER. Bell Sample : ARSIS / ERDENKLANG MUSLKVERLAG. Music Supervisor: Budd CARR. Music Executive: Joel SILL. Music Coordinator: Christina KLINE. Art Direction and Design: Roxanne SLIMAK / Detchapat ARTTASAN - Vangelis Photography: Stathis ZALIDIS. © 2004 Sony BMG Music Entertainment / (p) 2004 Sony BMG Music Entertainment / «Sony Classical» are Trademarks of Sony Corporation. Alexander and Elements and Characters Thereof (™) & © 2004 IMF3. All Rights Reserved. 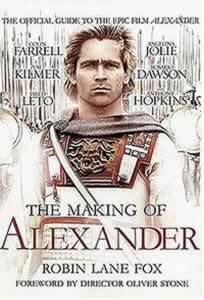 Alexander film footage courtesy of Intermedia Film Distribution, Inc. Software © 2004 Ubisoft Entertainment. All Rights Reserved. IMF3 Name and Logo (™) & © 2004 IMF3. Intermedia Name and Logo (™). Ubisoft and the Ubisoft Logo are trademarks of Ubisoft Entertainment in the U.S. and/or Other Countries. Developed by GSC Game World. Jean-Pierre LAVOIGNAT (photos Luc ROUX), «Avec Oliver Stone et Colin Farrell, dans le palais d'Alexandre le Grand», Studio, Spécial n­ 200, avril 2004, pp. 90-97; «Carnet de tournage», Juliette MICHAUD, «Colin Farrell - L'aventure d'Alexandre. Interview exclusive du jeune héros d'Oliver Stone. Le récit d'un projet fou», Studio, n­ 207, décembre 2004, pp. 72-83; Jean-Paul CHAILLET, «Colin Farrell la Quête du Grand» [interview], Christophe CHADEFAUD, «Macédoine indigeste», Gwen DOUQUET [interview Oliver Stone], Philippe PAUMIER, «Glandeur et décadence», Ciné-Live, n­ 86, janvier 2005, pp. 31-39, 45; Daniel DE BELIE (avec Delphine ROUSSEAU-PELSENEER à Hollywood), Ciné-TéléRevue, n­ 53, 30 décembre 2004; Alain BIELIK, «Alexandre», Robin LYNCH, «Oliver Stone, réalisateur, producteur, scénariste» [interview], Le cinéma S.F.X., n­ 113, décembre 2004-janvier 2005, pp. 16-23; Didier STIERS, «Alexandre le Grand, l'homme qui devait être roi» [interview Oliver Stone], Le Soir (Bruxelles), mercredi 5 janvier 2005, p. 4/Mad; Alain LORFÈVRE, «Mosaïque : Alexandre le malheureux» et «Franc-tireur : Oliver Stone, le conquérant solitaire» [interview Oliver Stone], Paul VAUTE, «Que l'empire est beau sous la république», La Libre Belgique, mercredi 5 janvier 2005; Frédéric VANDECASSERIE, «Alexandre le Grand. La statue de Stone» [interview Oliver Stone] et Paulette NANDRIN, «Le mystère Alexandre», Télé-Moustique, n­ 4119, 5 janvier 2005, pp. 22-24 et 148; Frank ROUSSEAU, «J'attends le jour où l'on organisera un sondage pour désigner la femme la plus intelligente du monde» [interview d'Angelina Jolie], Ciné-TéléRevue, n­ 1, 6 janvier 2005, pp. 20-23; Frank ROUSSEAU, «A l'époque d'Alexandre, il n'y avait pas autant de tabous» [interview de Colin Farrell], Ciné-TéléRevue, n­ 2, 13 janvier 2005, pp. 26-27; «Comment ça marche - Les acteurs d'Alexandre, le péplum d'Oliver Stone, ont subi un entraînement commando. Un ancien «marine» (1) s'est occupé d'eux. Il raconte...», Première, n­ 335, janvier 2005. Sébastien LAPAQUE (phot. Eric MARTIN), «Nos séries de l'été : Alexandre», Le Figaro magazine, de juin à août 2004 [série de reportages sur les conquêtes d'Alexandre]; Théophile MONNIER, «Alexandre le Grand. Entre mythe et réalité» et Philippe RICHARDOT, «Les stratégies d'Alexandre», «Les campagnes», «L'armée d'Alexandre», Champs de bataille (Histoire militaire, stratégie & analyse), n­ 4, novembre-décembre 2004, pp. 6-40; François QUENIN, «Le dernier Grec de la civilisation hellénique» (interview O. Stone), Alexandre GRANDAZZI, «Maître du Monde à 33 ans», Jean MALYE, «L'enfance d'un chef», A. GRANDAZZI, «Raid en Orient», Richard LEBEAU, «Alexandrie, le répit du guerrier», Pierre BRIANT, «A la poursuite de Darius», Pascal CHARVET, «Le conquérant vaincu par ses troupes», Paul FAURE, «Mort du héros», Historia, n­ 697, janvier 2005, pp. 6-7, 46-72. A Babylone, Alexandre agonise, entouré de ses officiers qui le pressent de nommer qui doit lui succéder. Il retire sa bague, mais elle lui échappe et tombe sur le sol... Quarante ans plus tard, Ptolémée dicte ses Mémoires à son secrétaire Cadmos. Dans ses appartements à Pella, capitale de la Macédoine, Olympias la «Sorcière» familiarise son jeune fils de quatre ans, Alexandre au contact de ses serpents familiers. Philippe, ivre, entre et force Olympias sous les yeux du petit Alexandre. Huit ans plus tard. A la palestre, les jeunes gens s'entraînent à la lutte. Alexandre (12 ans) et son ami Hephæstion se mesurent, et c'est le jeune prince qui touche le sol de ses épaules. Ils suivent les leçons du philosophe Aristote, qui disserte de la politique - «Les Perses, de race inférieure, contrôlent les deux tiers du monde connu.» De ses conceptions cosmographiques, aussi - «le Nil serait en contact avec l'Océan extérieur». De la morale - l'amour d'Achille et de Patrocle, où l'éloge de la pédérastie bien comprise... Un marchand de chevaux vient proposer au roi Philippe un superbe étalon noir, particulièrement intraitable. Seul Alexandre, qui a compris que la pauvre bête avait surtout peur... de son ombre, réussit à le dompter et le nomme «Bucéphale». Un jour, son père lui fait visiter les couloirs d'un ancien palais abandonné, décoré de fresques représentant les héros des mythes : Achille («la gloire ne va pas sans la souffrance»), Prométhée (le foie dévoré), dipe (les yeux crevés), Médée (la matricide : «Il n'est jamais facile d'échapper à sa mère, Alexandre. Méfie-toi des femmes, pires que les hommes»), Hercule («Un roi apprend à faire du mal à ceux qu'il aime»). Dans l'hôpital de campagne improvisé sur le champ de bataille, le sang ruisselle de partout. Alexandre aide à mourir un soldat illyrien nommé Glaucos (d'un coup de ciseau dans la nuque, un chirurgien abrège son agonie). Alexandre pleure ce soldat. L'il de l'aigle survolant le champ de bataille nous ramène au narrateur, Ptolémée. A 25 ans Alexandre était maître de tout. Vainqueurs à Gaugamèle, les Macédoniens entrent dans Babylone. Ces vainqueurs s'étonnent de constater le degré de civilisation des «barbares». Parménion et Alexandre se congratulent : «Nous régnons sur 8.000.000 km_».» Le harem de Darius leur est présenté... Voyant ces sublimes femmes, Léonnatos, l'un des gardes du corps fait une fine allusion à sa camaraderie avec son collègue Lysimaque : «Comment revenir dans les bras de Lysimaque après tout ça ?» Regards croisés d'Alexandre et de l'eunuque Bagoas. Olympias écrit à Alexandre : «Oui, elle [Stateira] serait parfaite pour toi ! (...) Ca fait trois mois que tu es à Babylone et que je n'ai pas de nouvelles de toi (...). Pense à toi et à ta mère. Hors Parménion (8), tous te trahissent.» «Fais-moi venir à Babylone.» Doléances et exigences qu'Alexandre commente à Hephæstion : «Forte rançon pour m'avoir abrité dans son ventre pendant neuf mois !» (9). Ptolémée reprend le fil de son récit : «Dans le nord-est de la Perse, Alexandre mena une guérilla de trois ans contre Darius, qu'il traqua jusqu'en Bactriane. Là Darius fut assassiné par des officiers félons, qu'Alexandre entreprit de traquer jusqu'au delà de l'Oxus.» Fondation en Bactriane de la 10e Alexandrie, où il installa une colonie de vétérans. Alexandre prend des mesures pour intégrer les «barbares asiatiques» au projet grec. Son mariage en est une première étape. Lors de sa nuit de noces, Hephæstion s'introduit dans la chambre de son ami pour lui offrir une bague précieuse à Alexandre. Roxane surprend le conversation des amants et impose à son époux une nuit de noces âpre et difficile. «Tu... aimes cet homme ? - C'est Hephæstion. Il y a bien des façons différentes d'aimer, Roxane...», répond Alexandre penaud. Lutte, poignard. Finalement, pour pouvoir posséder sa femme, Alexandre doit ôter la bague d'Hephæstion. Des pages se mettent à conspirer contre leur roi; l'un d'eux, Hermolaos, lui a fait porter du vin empoisonné. La réaction d'Alexandre est foudroyante : coupable d'avoir tenu des propos présomptueux, le général Philotas est mis à la question et finalement abattu d'un coup de javelot. Pour faire bonne mesure, Antigonos et Cleitos sont envoyés à Babylone où ils poignardent Parménion, père de Philotas. Pendant qu'Antigonos et Cleitos assassinent Parménion, Alexandre compulse ses cartes et ses notes. 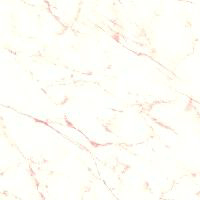 Ce travail achevé, Alexandre se glisse - nu - sous la couette et, de la main, adresse un signe d'invite à Hephæstion. Les Macédoniens franchissent l'Indus; leur armée progresse dans la jungle. Cratère, qui marche en avant avec la Garde, se heurte à une armée de petits hommes poilus... des singes. Il pleut soixante jours et soixante nuits d'affilée. Les Grecs massacrent les Indiens, mais pataugent dans de l'eau putride, imbuvable. Ils ne boivent plus que du vin. Vainqueur, Alexandre confirme les roitelets indiens dans leurs anciens privilège. Un festin sanctionne leur alliance avec le conquérant macédonien, au cours duquel l'eunuque Bagoas entreprend une danse lascive. Incontinent, Alexandre lui baise longuement la bouche, sous les acclamations de ses officiers. Mais l'instant d'après, ceux-ci maugréent contre l'insatiabilité de conquête de leur roi. «Alexandre veut-il imiter la gloire d'Hercule, et celle de Dionysos 6.000 ans avant Hercule ?» Même la Sogdienne Roxane, exhale sa haine de Persane pour les Indiens méprisables, qu'elle juge indignes de la confiance de son époux. Mais le conquérant reste inébranlable dans sa volonté de laisser ces gens se gouverner eux-mêmes : il laisse en place les princes qui lui ont fait allégeance. Donc, pas de postes à pourvoir pour les officiers supérieurs macédoniens. Ivre, Cleitos laisse éclater sa rancur et délibérément provoque la colère d'Alexandre. «Aucun fidèle Macédonien ne reçoit de satrapie» à gouverner, se plaint-il. A quoi Alexandre rétorque : «Grecs et Perses agissent selon leur nature : les Perses m'adorent comme un dieu, pas les Grecs !» «Tu prends une barbare stérile que tu oses appeler la «reine» ! (...) Je t'ai sauvé la vie à Gaugamèle !», rétorque Cleitos. Finalement Alexandre, guère plus lucide que son ami querelleur, s'empare d'un javelot et le transperce. Flash-back : Huit ans plus tôt - à Pella (Macédoine). Feignant d'ignorer l'existence de l'enfant (11) que vient de lui donner Eurydice, Philippe déclare à Alexandre : «Tu me succéderas !» Quelques instants plus tard, lorsqu'il s'agit de s'engager dans le couloir par où il apparaîtra devant son peuple à l'occasion du mariage de sa fille Cleopatra (12) avec Alexandre roi des Molosses, le vieil homme jaloux de son pouvoir reprend le dessus. Il refuse que son fils se tienne à ses côtés : «Tu veux que tout le monde te voie comme mon successeur ?» Alexandre s'écarte donc, et va rejoindre les gradins par une autre voie. A peine le portique franchi, Pausanias - son garde du corps - assassine Philippe. Le fidèle Hephæstion proclame Alexandre roi, pendant que les autres gardes du corps pourchassent et massacrent Pausanias. Immédiatement, Alexandre soupçonne sa mère d'être l'instigatrice de ce meurtre. «As-tu... ou n'as-tu pas... ? Tu es une sorcière et tu m'as menti !» «Il était rude et tu es raffiné», répond Olympias. Incompréhension d'Alexandre. Sa fureur. «Tu m'as tué dans mon berceau, sorcière !», reproche-t-il. Alexandre croit que son armée n'est plus qu'à quelques semaines de marche de l'Océan. Mais la troupe se rebelle. A qui encore se fier ? A Méléagre ? A Lysimaque ? A Antigonos ? Même le fidèle Cratère plaide pour les soldats : «Certains sont morts en héros, d'autres parce qu'ils n'ont pas eu de chance. Il y a huit ans, ils étaient 40.000; ils ont marché plus de 15.000 km, sous la pluie, sous le soleil, et certains ont livré jusqu'à quinze batailles.» Alexandre rétorque qu'il a partagé leur ordinaire, et qu'«il n'y a pas une partie de mon corps qui n'ait été blessée.» Feignant la conciliation, il parle de licencier les «Boucliers d'Argent», ainsi que ceux qui ont plus de sept ans de service. Puis il s'indigne : «Mais vous n'aimez que l'or (...) et moi je continuerai avec mes Asiatiques. (...) Je ne me suis jamais enrichi. (...) Je vais à l'Est.» Mécontentement des troupes. Certains l'accusent même d'avoir fait mourir son père. Exécution des meneurs, dont on aperçoit les corps suppliciés (par lapidation ?). 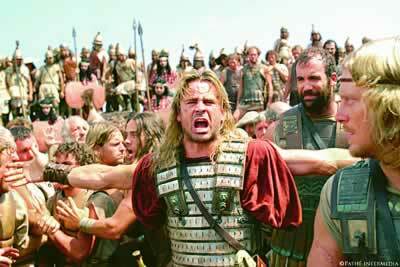 Alexandre face à ses soldats mutinés (hors champ). «Rentrez chez vous, je continuerai seul avec mes Asiatiques.» (phot. Intermedia). Ptolémée reprend la parole : Alexandre cède devant ses hommes et renonce à franchir l'Hindou-Kouch. L'armée entreprend de descendre vers le sud. Revoici l'armée macédonienne dans la jungle indienne. La phalange va affronter les éléphants (13) qu'on n'aperçoit pas encore, mais sous les pattes desquels, déjà, le sol tremble. Les voici qui déferlent. Les archers indiens prennent la cavalerie macédonienne pour cible. Fidèle à sa tactique favorite, Alexandre laisse Cratère absorber le choc de l'ennemi, place Méléagre en appoint et, ralliant Hephæstion, déborde l'ennemi par la gauche cette fois. La mêlée est titanesque, wagnérienne (14). «N'est ce pas une chose merveilleuse de vivre avec grand courage et de mourir dans une gloire éternelle ?», s'écrie exalté le nouvel Achille, encerclé de partout, couvert de sang de la tête aux pieds. L'issue de la bataille est très incertaine, et chacun lutte simplement pour survivre. Alexandre pousse Bucéphale vers l'éléphant du chef ennemi : les deux montures se cabrent. Bucéphale est tué, mais Alexandre prend également une flèche en pleine poitrine. Images psychédéliques... le ciel, la forêt, tout vire au rouge. («Ce fut la plus sanglante de toutes ses batailles, une boucherie. La fin de toute raison. Nous ne serions plus jamais des hommes», dit Ptolémée en voix off.) Ses hommes emportent sur un bouclier le corps d'Alexandre dans le coma. Quelques jours plus tard, Alexandre sort de sous sa tente, encore affaibli, mais il rassure ses hommes. L'armée rentrera. Regard énigmatique de Roxane. Ovation des troupes. Après avoir dédié douze autels aux douze dieux de l'Olympe, Alexandre ordonne la retraite. Retour à Babylone. Alexandre prend deux nouvelles épouses (le film ne les nomme ni ne les montre). C'est alors qu'Hephæstion tombe malade. A-t-il contracté le typhus en Inde ? Alexandre tente de le remotiver, de lutter pour vivre. Il a tant de projets d'expédition. Nous partons pour «l'Arabie au printemps, mais pas sans toi (...) [Toi] le seul homme qui ne m'a jamais laissé gagner. Le seul honnête... Qui m'a sauvé de moi-même... Achille et Patrocle. (Larmes) Je ne suis rien sans toi. Bats-toi, Hephæstion. Nous mourrons côte à côte. Nous aurons des enfants de nos femmes, et nos fils joueront ensemble. Puis nous marcherons contre Carthage, la Sicile, la tribu des Romains (de bons guerriers), les Forêts du Nord, et au-delà des Colonnes d'Hercule.» Hephæstion rend l'âme. Fureur d'Alexandre, qui soupçonne tout le monde : «Tout le monde le détestait !» Il ordonne la mise à mort de son médecin. Puis il se jette sur Roxane, qu'il veut étrangler, et voit alors se substituer le visage de sa mère à celui de son épouse pantelante. Roxane ne sauve sa vie qu'en annonçant à son royal époux qu'elle attend un enfant de lui. Alexandre s'étourdit dans les orgies, et les excès de boisson. Il se déguise en Hercule, revêtu d'une peau de lion, tête en casque. Dans le vin au fond de sa coupe, il croit encore voir le visage gorgonéen de sa mère Olympias, couronnée de serpents. Une obsession. Un dernier regard luxurieux pour Bagoas. Un malaise. La bague d'Hephæstion tombe de sa main. C'était le 10 juin 323. Les généraux se disputèrent le pouvoir. Sept ans plus tard, Cassandre fit exécuter Olympias. Et plus tard Roxane et son fils de treize ans. «Certes, personne ne peut prétendre à l'exhaustivité en s'attaquant au plus grand conquérant de l'Antiquité. Mais le défi implique a fortiori de suivre un point de vue. Or, quoi qu'il en dise et aussi étonnant que cela puisse paraître de la part d'un réalisateur aux opinions généralement tranchées, le film hésite, s'égare même, entre plusieurs approches pour aborder la personnalité d'Alexandre : qu'est-ce qui motivait ses conquêtes ? Fut-il un tyran ou un despote éclairé ? A-t-il été empoisonné ? (2) Au cours de ce banquet, l'on voit Pausanias se faire accoster par les compagnons d'Attale et subir des violences hors champ, dont seule la bande son rend compte. C'est une des nombreuses notations/allusions qui foisonnent dans le film d'O. Stone, mais guère explicites pour le spectateur non averti. (6) Il ne faut pas confondre l'épouse de Darius, Stateira 1, avec sa fille Stateira 2, également connue des historiens sous le nom de Barsine (et parfois confondue avec Barsine fille d'Artabaze, veuve de Memnon de Rhodes). (13) Cette bataille de cavaliers et d'éléphants dans la forêt laisse perplexe. O. Stone semble avoir voulu tirer parti du décor de la Thaïlande où il a trouvé ses éléphants, mais ce n'est certes pas l'endroit idéal pour une bataille rangée avec de la cavalerie (quand aux chars, n'y pensons pas !). 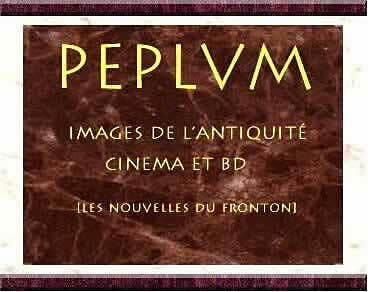 De même qu'il a oublié les éléphants perses de la bataille de Gaugamèle, filmée au Maroc, il a oublié les chars indiens dans ce nouvel affrontement qui, du reste, en amalgame deux : la bataille de l'Hydaspe contre Pôros (été 326) et celle contre les Malles, où il est grièvement blessé (automne 326).